A VPN (virtual private network) is one of the best ways to protect your privacy online as it encrypts your web connections meaning that any monitoring agencies can’t see what sites you are visiting, data you’re downloading, etc. Your data is essentially “tunnelled” and encrypted through the VPN provider’s own servers meaning your IP address is hidden, your geographic surfing location can be changed and no one in the middle of the connection, not even your Internet Service Provider, can see the data or what sites you’re visiting. Loosely speaking, it sort of like using an anonymous proxy but a VPN covers your entire connection and it’s better, faster and much more secure. The following simple illustration will show you how a VPN works to help you protect your privacy and even change your geo-location if required. If your goal is simply to protect your privacy then all you need to do is connect to the nearest VPN server to your own geo-location. Your IP address will be hidden and your connection encrypted. However a VPN can do more that that if required. 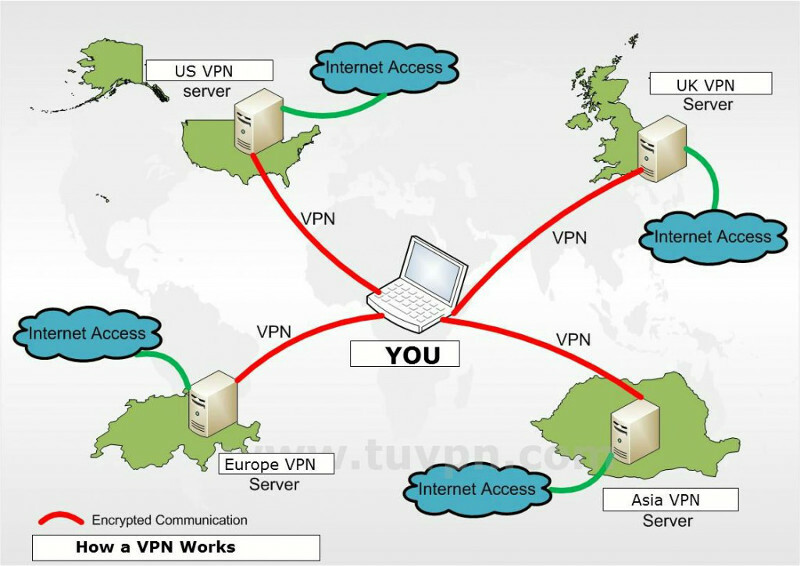 Most good VPN service providers offer a wide choice of servers in several different countries. Once signed up to a VPN, select a server located in the country you require and connect to it. Once the connection has been established you can then access the internet as though you were physically located in that location. This can allow you to unblock certain websites that restrict access based on geo-location. So, for example to access the BBC iPlayer or ITV from outside the UK, simply first connect to one of the VPN service provider’s UK servers. Likewise, to access Hulu, Netflix, etc. from outside the US, first connect to one of the VPN service provider’s US servers. This means you can unblock censored websites, prevent ISP monitoring and throttling and protect your privacy and security online. Reasons to use a VPN? Privacy – protect your privacy online by encrypting your web connections meaning that any monitoring agencies can only see your traffic usage and not what sites you are visiting, etc. Security – An encrypted connection is a secure connection, so that even if your data is intercepted (like at a wi-fi hotspot), it’s pretty much useless to the person who captured it. Bypass geographic content restrictions – Access Hulu from outside the US, BBC videos aren’t available outside the UK, etc. Avoid unfair “traffic shaping” – some ISP’s will slow traffic down when they detect certain types of data being transferred (such as videos). Get around government or network filters and censors in restrictive countries like China, Iran, etc. People who frequently use wi-fi or public networks – Wi-fi networks at airports, coffee shops, etc. totally lack any kind of privacy or security without use of a VPN. Expats and Travelers – Many people away from their home country routinely find themselves unable to access certain content they were used to at home (i.e. – Hulu) or they may end up behind a local government restriction filter. Students behind overly restrictive firewalls or unsecure networks at school – Some universities go completely overboard with their network restrictions which can sometimes even prevent students from doing basic research. Many end up using VPN’s so they don’t have to worry about that issue. Bittorrent and P2P users – There is no doubt many people use torrents and p2p networks for sharing copyrighted content and therefore seek to hide this by using a VPN. Privacy conscious individuals who are fed up with the massive increase in Big Brother snooping from the likes of the NSA in the US and GCHQ in the UK. Whilst your data is “tunnelled” and encrypted through the VPN provider’s own servers, remember they can see the data and trace it back to you so it’s vital to choose a VPN provider you can trust and who keeps no logs of your internet activity. Be sure therefore to closely scrutinize the VPN providers privacy policies.